By the end of trading Tuesday, the world’s 500 billionaires controlled $5.3 trillion, up from $4.4 trillion on Dec. 27, 2016. Amazon.com founder Jeff Bezos added the most in 2017, with a $34.2 billion gain that knocked Microsoft co-founder Bill Gates out of his spot as the world’s richest person in October. 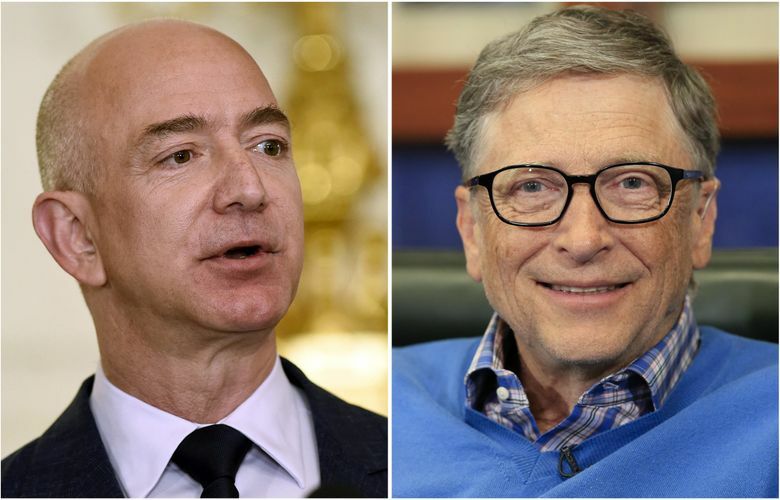 Gates, 62, had held the spot since May 2013, and he has been donating much of his fortune to charity, including a $4.6 billion pledge he made to the Bill & Melinda Gates Foundation in August. Bezos, whose net worth topped $100 billion at the end of November, now has a net worth of $99.6 billion compared with $91.3 billion for Gates. By the end of trading Tuesday, the 500 billionaires controlled $5.3 trillion, up from $4.4 trillion on Dec. 27, 2016. • The 38 Chinese billionaires on the Bloomberg index added $177 billion in 2017, a 65 percent gain that was the biggest of the 49 countries represented. • Hui Ka Yan, founder of developer China Evergrande Group, added $25.9 billion, a 350 percent jump from this past year, and the second-biggest U.S. dollar gain on the index, after Bezos. • Technology billionaire Ma Huateng, co-founder of messaging service Tencent Holdings, became Asia’s second-richest person when his fortune nearly doubled to $41 billion. • The number of Asian billionaires surpassed those in the United States for the first time, according to a UBS Group AG and PricewaterhouseCoopers report. • The United States has the largest presence on the index, with 159 billionaires who added $315 billion, an 18 percent gain that gives them a collective net worth of $2 trillion. • Russia’s 27 richest people put behind them the economic pain that followed President Vladimir Putin’s 2014 annexation of Crimea, adding $29 billion to $275 billion, surpassing the collective net worth they had before Western economic sanctions began. • It was also a banner year for tech moguls, with the 57 technology billionaires on the index adding $262 billion, a 35 percent increase that was the most of any sector on the ranking. • Facebook co-founder Mark Zuckerberg had the fourth-largest U.S. dollar increase on the index, adding $22.6 billion, or 45 percent, and filed plans to sell 18 percent of his stake in the social-media giant as part of his plan to give away the majority of his $72.6 billion fortune. • In all, the 440 billionaires on the index who added to their fortunes in 2017 gained a combined $1.05 trillion. • The fortune of French telecommunications billionaire Patrick Drahi fell $4.1 billion to $6.3 billion, a 39 percent drop. • Prince Alwaleed Bin Talal, the richest person in Saudi Arabia, dropped $1.9 billion to $17.8 billion after he was detained in a crackdown against corruption led by Crown Prince Mohammed bin Salman that targeted royals, government officials and business leaders. • There were 60 billionaires who fell from the ranking, including South African retailer Christo Wiese, whose fortune dropped to $1.8 billion from a peak of $7.7 billion, in August 2016, after news of an accounting scandal at his Steinhoff International Holdings NV broke Dec. 5. • Sumner Redstone, 94, also fell off the list as CBS owner Viacom continued to grapple with a bitter battle for control between his daughter and other executives, while Rupert Murdoch, 86, sidestepped succession concerns with a December deal to sell much of 21st Century Fox’s entertainment assets to Walt Disney. Redstone shed $90 million. Murdoch added $2.7 billion. • In all, the 58 of the 500 billionaires who saw their fortunes shrink in 2017 lost a combined $46 billion. • Renaissance Technologies’ Henry Laufer was identified with a net worth of $4 billion in April. Robert Mercer, 71, who plans to step down as co-CEO of the world’s most profitable trading fund on Jan. 1, couldn’t be confirmed as a billionaire. • Two fish billionaires were caught: Russia’s Vitaly Orlov and Chuck Bundrant of Seattle-based Trident Seafood. • A Brazilian tycoon who built a $1.3 billion fortune with Latin America’s biggest wind developer was interviewed in April. • Two New York real-estate moguls were identified: Ben Ashkenazy and Joel Wiener. • Several technology startup billionaires were identified, including the chief executive officer of Roku and two co-founders of Wayfair. • Investor euphoria created a number of bitcoin billionaires, including Tyler and Cameron Winkelvoss, with the value of the cryptocurrency soaring to more than $16,000 Tuesday, up from $1,140 on Jan. 4. The leap came with a chorus of warnings, including from Janet Yellen, who called the emerging tender a “highly speculative asset” at her last news conference as chair of the Federal Reserve, on Dec. 13. With wealth surging to new highs, billionaires may quickly learn that a billion dollars doesn’t buy what it used to. The price of housing has topped $300 million, the cost of divorce has hit $1 billion and a rediscovered painting by Leonardo da Vinci sold for $450.3 million at a Christie’s auction in November, the most expensive work ever sold.